My employer slid the door shut with a soft thud as soon as I nodded, but then I heard her footsteps breaking into almost a run outside; she'd seemed eager to leave ever since she’d slid the door to their annex building open for me. I placed the paper at an angle on the corner of the tray I was carrying, so that I could see it with my hands occupied. Then I looked up. So many candles and lanterns, and other lighting equipment, adorned the annex building that extended before me, and yet, the entire space seemed too dim. No light reached the ceiling, which wasn’t particularly high. Shelves and tables, or very tall candlesticks, blocked the view to the center of the building, which was my destination. Something flickered over one of the thick beams, where it wasn’t as dark as the ceiling but still too high for my own shadow to reach. I breathed, in, and out. 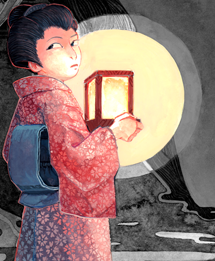 Take five steps to stand right in front of the first lantern—and don't look at the beautifully painted one just beside it for too long; that would only end up disastrous. Face straight to the simple one, clap your hands two times to give loud sounds. I couldn’t do this, not with the tray, so I had to make do with stomping my foot on the recently cemented floor; they’d given me a pair of sandals that’d generate a sound that carried, when it struck the floor, and I had the impression that the cement patch underfoot had been installed specifically for this purpose. Now turn forty-five degrees to the right. This time, let the fanciness speak to you. Take exactly five steps again, to be close enough to the ornately carved candle holder to feel its warmth. Exhale just enough breath to stir the flame, never—never—enough to put it out. Instructions after instructions like these forever, scribbled over the paper, with the rough layout of the lanterns, candle dishes and incense bowls, et cetera, et cetera. With my short legs, and the robe I'd chosen to wear for my first day for this new job restricting my movement, I had to measure my strides carefully. The soup on the tray gone long cold, and every joint in my no-longer-young body numb, I finally found the first son of the family in the middle of the annex. The burn scars on my palms—marks of my betrayal—felt raw where I gripped the wooden tray too tight for too long, and I had trouble letting go of it as I set the meal down. “Yes, sir.” I stifled a sigh of exhaustion. There was no seat as far as I could see, so I sat down on the corner of his pallet. His pallet was lit by a lantern placed beside his low, small desk, an ordinary light, whereas the candle burning on the other side of the desk whispered magic, the way it sizzled. I looked up and around: from here, in the safety of the ordinary flame of his lantern, all the lighting equipment seemed to cast both light and dimness. Each device confined one monster, which was trapped to play a role in the greater sealing magic that bound the whole annex. I couldn’t feel the monsters, not any longer, but just see the flames and lights flicker unnaturally, which made me careful enough but not too frightened. And that had been the problem with the younger people with stronger magic in them, who had previously worked in this position—they saw and felt too much, got frightened too easily or acted too boldly, with their quicker minds. In front of us gaped a void. I swallowed. This was not the first time I had seen a ghost of course, but the first time in quite a long while I had seen a ghost summoned this way, and surely the first time I saw someone other than my father do the summoning. A beautiful woman, maybe ten or fifteen years younger than me, if she were alive. I couldn’t help but stand for a better look. Beside her, as if lit by the ghost’s presence, a small table appeared. On it a simple black incense holder sat. My breath caught as the ghost struck a match. The flame seemed to carve her outlines deeper against the dark, and I could see her eyes shine as she took one out of the pile of incense sticks on the table and touched the flame to its tip. The ghost blew on the match and the flame went out, making her sink into dimness again. In the smoke, as it got thicker and thicker around the stick, I started to see the image: a woman and a small boy. Mother and son. The boy waved, but to whom, I had no idea. I knew the first son—the man beside me—wanted to believe the child was waving at him, that the mother was smiling at him. But the gestures, their expressions, everything about the image seemed distant, hollow. Which made it all the sadder, all the more horrifying. Reversing the steps I’d gone through was the hardest part, in fact. By the time I was safely out of the annex building I was exhausted, my eyes aching, shoulders too stiff even to sit straight. I came awake out of my half-sleep on the main building’s porch, with the sound of a cup placed near me. My employer, the first son’s younger sister, knelt beside me with a tray to her chest, both of us now facing the garden as if afraid to meet each other’s eyes. “Thank you,” I said as I took the cup with one hand and massaged my eyebrow with the other. The tea was a bit too thick, which was good, and she probably knew that well. There was also a very nice-looking piece of confection, shaped like a simplified flower, its color soft pink. “Peony?” I asked without thinking. The family’s crest. “Debts are debts. Damage done to reputation cannot ever be repaired, but I’m lucky you let me try anyway.” More than half of this, I was literally repeating my father. My palms tingled, where burn scars reminded me what a nuisance I was to the family. This family had a magic to tie someone’s soul to a place, or to another person, and they used this magic to keep servants, or sometimes even mistreated wives, from running away. And I had been bound by the same magic, once. Trivial as I was, a daughter related to this family being under the magic was bad enough; but I managed to cast away that bond, in the wrong way, which was blasphemous to the family, to say the least. I blinked. I had thought everyone, every member of this family, blamed me for the damage. I didn’t know what to say, but then I heard a child burst into crying somewhere in the house; I tensed. I watched her back as she shuffled along the corridor, around a corner and disappeared. Looking around to make sure no one was watching, I put my tea down and slid closer to the peony confection. At home, no one would hire me, let alone give me something sweet, because of the mistake I’d made. But my father had found this job for me, too lowly for the member of the head family itself, but one they didn’t want to assign to a total stranger. I was a perfect fit here. I cut it into pieces and put one into my mouth. Delicately sweet and fragrant. Silky to the tongue. Day after day, the first son stared into the nothingness, and I carried his meals. After a week or so my pilgrimage, as it were, became a sort of pattern, and I could perform it without too much thinking. I asked no questions to him or to his sister, and I knew only a handful of truths about all this: that his wife and son were very dead, and the image in the smoke was the only thing keeping the first son alive; that the first son had sealed the annex, and the procedures I followed every day now were required to keep that seal in place. I’d seen a device like this annex, though much, much smaller in scale, in my home village. It was shaped like a simple house the size of a home altar, and my father had trapped a monster in it which was around that time messing with the village’s harvest. My father, the head of one of the far-spread branches of this family I worked for, set a few complex traps to prevent other monsters from breaking the seal. If someone, something, failed in the undoing, the altar would collapse and the trapped monster would be confined forever in the ruins, together with the thing which had tried to break in. If this annex worked on the same theory, should I ever fail, the ghosts, the first son, and I would be trapped here forever. And it was likely other monsters were bound against their will, even if they didn’t deserve this treatment, to the lighting equipment as a means to complicate and strengthen the magical seal. Something this family—and my father—did all the time. I’d shudder at the flickering of the shadows sometimes, with this thought in mind. I didn’t have much magic left in me, but it wasn’t like I could drain my blood completely and unsee and unlearn everything. It had been a few weeks since I started working here, when, one day, a servant accidentally slammed the door shut, which was discouraged. Not because closing the door gently was part of the procedures, but because a wind too strong might cause some kind of reaction inside the annex, like put out some of the bare flames—no one but the first son was sure how magical these flames were. I stood there for a few heartbeats, waiting for something to happen. I let out a faint sigh and looked down at the tray. The instruction paper was not there. I almost yelped: in my desperation my foot had moved, though just a little. I listened; nothing again. I managed to catch the paper. Stood up. I looked up, ready to set out, ready to forget what’d just happened. But to my dismay, I realized something was wrong; the lights from the equipment connected to the floor seemed to have changed hues. Maybe just my eyes getting older? But then the circles on the floor from these lights—where they didn’t overlap with the lights from the ceiling or on the wall—seemed to waver, just a little. Like water rippling as an insect glided over it. Was this, too, some kind of trick that my aging eyes were doing? I almost cried out, managed to stop myself with a miracle I really didn’t deserve. In the shadows made with the hanging lights, there she was, beautiful as ever. The match-lighting ghost. “You could have screamed,” she said. But I should be a power-less. I had been made power-less, in fact, months ago. “How did you come to work for him?” I asked her, still a little confused. I shuddered at the implication—there was no telling if that had indeed been an accident. And they kept the master-servant tie even after the servant was dead? “I’m sorry,” was the only thing I could say. “And that is?” Did I want to know? “That’s not the same! You’re not even related to these people by blood.” But before she could say anything for an answer to that, she flickered out. After a moment I realized the first son must have summoned her. I took time deliberately, and arrived at his pallet just when the smoke image was going out. Good for me. The ghost was looking at the smoke as it slowly dispersed. Her profile was a silhouette, but for some reason, I sensed that she did something—maybe smile. Something she’d probably never done in that void before. A flicker of something like a shade of life, in that lifeless space. The first son sucked in a sharp breath. I wasn’t sure if he saw what I saw, or if he simply wanted to draw the smoke into him. No, I wanted to say. The dead will never come back. The past can never be undone. “I’ll bring some amazake,” I said instead. He blinked again, but said nothing in reply and stared on at me as if he didn’t quite understand what’d just happened. I bowed and started my backward procedures. When I came back with a slightly steaming cup of amazake (I had wrapped it in cloths to keep it as warm as it could be), he was asleep. This was the first time I saw him sleeping—I hadn’t even seen him eat or drink before for that matter, anything that indicated he was human, not a ghost. I looked to the void. The last of the steam from the cup looked a little like smoke, but when she appeared behind it, I jumped all the same. “You know, people of this house don’t do that,” she said, laughing. I sighed again, and when the steam drifted away I saw her robe, laden with flower printing, or maybe even embroidery. “That’s beautiful,” I said, forgetting about the man asleep at my feet. “I wasn’t aware your robe was patterned.” Peony flowers, the crest of this family. I tried to ask around, what it meant if a ghost changed its appearance. This was a house full of ghost experts, after all. I’d intended to ask my employer first, but she was out for the day. So after doing a small chore for one of the younger husbands, I ventured and asked him, because for that moment he seemed friendly enough. Without another word the young man left me. I looked at the front-ground of the house and the annex at the end of it. Maybe the first son was an “it,” just like me. Just like every ghost and monster confined in that building. He didn’t wait for me to say anything further. Before I could decide whether or not to ignore his order, he went on to summon the match-lighting ghost. Her robe’s patterns now seemed even clearer against the dark, the flowers more colorful. I could see thin lines of golden threads at the edges of some of the petals, which I was sure hadn’t been there before. She looked very uncomfortable in it. Probably he had realized she was changing not because of her robe, but because of something only a powerful person could sense. Did I do this? Had my small misstep carried this all along, this far? That felt wrong, all wrong. I was a power-less. An idiot who’d let go of the precious family inheritance, ruining the family’s privilege. It was possible that I still had a thin trickle of magic left somewhere in me, enough to just trigger the change, perhaps—but this? And the flowers. They just didn’t make sense; what did a peony have to do with life? Her robe was overflowing with flowers, its beauty mesmerizing. She was a flower, the flower that illuminated that lightless void. The ghost reached for the match. The ghost, and the first son, both looked at me. And, surprisingly, he did. He looked around. It took a few moments, it seemed, for him to really take in the surroundings. I wasn’t sure if he had intended it that way, but many of the devices that were hanging from the ceiling or on the walls bore the crest of this family: peony. And their colors had started to change, responding to her changes. This whole annex was changing, unlike us two humans, who couldn’t find a way to change but age and wither. It wasn’t me who had made all of this happen. It was the first son; he had started it all long ago, when he’d built this place. Mine had been a feeble—even if necessary in retrospect—push that added just a little bit of momentum. I’d never spoken this much at a time since I left home, and I was panting, throat sore. He looked away from me now, his eyes on the void, where the match-lighting ghost—half monster—stood looking worried, unlit match in her hand. I was about to place my hand on his shoulder, when he stood, involuntarily brushing me away. This was the first time I saw him on his feet, and I wondered how people could be so terrified of such a small man. He walked over to the void, though his steps were unsteady, after a long time of disuse. He took the match out of her hand. I thought he, impatient now, was going to light the incense himself. But he turned on his heels, and came back to his pallet. “The paper,” he said, to me. I blinked, but then realized what he meant and gave him the wax paper with the instructions written. I said, “Yes, sir.” It was the only thing I could say right there, right then. The family trusted me now, because I was the person who led the first son out of the cursed annex. Burning the paper, and the interior of the building along, freed the match-lighting ghost, and broke the seal on the annex itself so that people could now access the center of the building without going through the painstaking procedures. But the fire didn’t burn the lighting equipment (magically warded against fire for good measure, apparently) to set free the other things bound in the annex. People upturned his pallet but couldn’t find the deed of property; they suspected one of the lanterns hid it, but the family was afraid to touch those traps still with the angry monsters inside. So they allowed me access, though grudgingly, to their books and records, along with their magical artifacts. And slowly, I learned how to deactivate the first son’s trapping spells. Why had no one done this? Had no one been willing enough to use their own energy on this? By the time I was sure I could free every monster in a way safe to both the monsters themselves and also the humans around the building, the first son was dead. He’d already been too weak when he’d got out. At least, some of the family were around his deathbed and he didn’t go alone. I started to work on actually unbinding the trapped monsters. After the first son left it, the building started decomposing, and no one knew when it’d collapse, so I declined my employer’s offer of help and went in alone. It was a strange feeling, seeing the familiar lights go out one by one. Were some of the trapped things ghosts, too, before they’d become trap-monsters? Maybe. I saw some human-forms, which flickered out or faded away instead of scuttling out of the annex. Some even bowed to me, I think. It took me almost a week, but finally, I was standing at his pallet, every light gone out around it. His pallet was charred but otherwise absurdly well-preserved, though I saw strange colors marking it that seemed to have nothing to do with the fire that had licked it; in my imagination the freed monsters had left their marks there, of hatred, of unforgivingness. I peered down and saw the colors went down to the earthen floor, and likely, deeper under. This kind of mark would never go away, no matter how hard we tried. I looked to the void, and squinted. Could I see some residue of smoke there, or was it the fine ashes of the incense from the bowl? With all the lights gone the void was so dark, even though there were windows near the ceiling. I didn't have a source of light, as I’d thought freeing the monsters would bring ordinary sunlight back into the annex. But the void remained the void, so I had to walk in with nothing, nothing to protect me from the hatred that filled that place. And the hatred found its mark. Memories did strange things, as you got older. Farther ones shone with clear-cut edges, while closer ones blurred and bled. Somewhere in-between, I saw the two figures standing side by side near the cliff. They were mere silhouettes against the night sky, which was brighter than the ground under them, and brighter, probably, than the invisible sea below that cliff. I know how to nullify magic, the girl was saying, with a voice that carried, so that I could hear her even from in the shadows where I hid, a few human lengths away. She was too young for my husband, but the glint in her eye was too cunning for her age. I can set you free from those monsters—your wife, your father-in-law. And then—Why did you let them? These, my father’s words, as he struck me, with his bony, weak hand and arm that I should have had no trouble flicking away. Why did you let him do it, why did you let him get away with it? And now and here, I looked down at my hands, which were marked with strange symbols near the fate lines on my palms. My father had made me and my husband share a cup of enchanted sake at our wedding so that some magic went inside us both, binding my husband to me; I had already long been tied to my father, so that would prevent both of us wandering away from him. Any branch of this family used that same magic to secure a master-servant bond, or sometimes a marriage, a business connection, depending on the client’s demand. That too-young girl had probably been a member of one of the families secured by this magical enforcement in one way or another. I do not know how she’d come up with these marks on my palms; did she think our magic wasn’t real and we were all just being superstitious, and that she could persuade my husband with this kind of show? The truth was, the only way to drain the magic my father had made us swallow at our wedding out of our bodies was through a ritual that had to be performed at a great cost on the performer’s side, if the magic had not been cast by the performer in the first place. I’d thought the ritual would simply kill me, the chain taking me down with it beyond reach of my father’s spell. And really, what is a woman to the world, without a man, a child, binding her to it? I ended up surviving it, though, losing my magic instead of life. This way I cut the link between me and my husband, the chain that had tethered him to my father. My father, and everyone related to this family, were furious that I’d exposed the fact that there had been a way to defy the magic they possessed. But my husband and his lover weren’t sure what had happened to me, so they sneaked in to my bedroom anyway, where I lay trying to recover from the aftermath of the ritual. I could have shouted for help, but I never did, and just let them burn those meaningless marks on my palms. Compared to all of that? The hatred that plagued the void wasn’t even toward me. It made the scars on my palms tingle, but only a little, and never followed me as I walked out. It was already long after dark when I went out of the annex. My employer was waiting for me with a torch just outside the door. “I didn’t know if I could come in to fetch you,” she said. I looked back at the annex over my shoulder. That would promise me a life without worrying about food and shelter till I die. Best choice I’d ever get, probably. “… Oh, what is that?” she said, looking down at my hand. I raised the thing I was holding. “Found this inside—it’s not haunted,” I hastily added. “Beautiful, isn’t it?” It was a small, simply shaped lantern, with a small peony flower carved at one point. The first son's lantern—the only lantern in that annex which was truly a lantern. The fire and the following chaos must have knocked it off into the void. I smiled again, an ambiguous answer, and walked back to the room allotted to me. 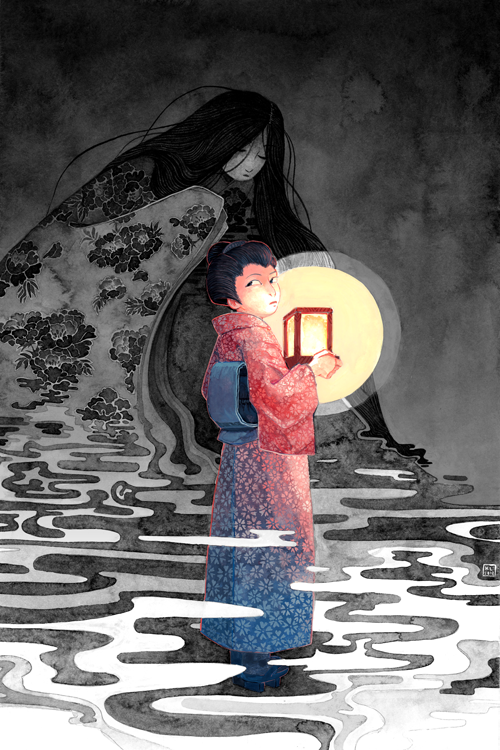 There, I struck an ordinary match, lit an ordinary candle and put it into the lantern I’d brought back from the void. And watched, as the flame steadied, as the shadow stretched out of the lantern, onto the wall of my room. I sighed. As she said, though broken into many pieces, the magical incense filled the lantern’s bottom, around the raised candle holder. “What am I supposed to do with these?” I said, truly at a loss but finding the situation laughable, for some reason. I heaved a sigh again. At least no child, no husband bound me to any place in the world. “Anything” really meant anything. Which reminded me of the ghosts, monsters, bound by my father’s doings. Just like in that annex, like by the first son. There were plenty of them, I knew, trapped in perpetual discomfort, endless pain, if my father hadn’t felt like fixing the situation. Maybe I could right the wrongs of my father, now that he was weak, and I had these dark secrets. And the knowledge I acquired through this family’s records. “You’ll help me, if I ask?” I ventured. In response, the ghost in the peony lantern grinned.